Thousands participated in the Philadelphia Women's March on Saturday, Jan. 20, 2018. It took place on the Ben Franklin Parkway near Eakins Oval and the Philadelphia Museum of art. Here, demonstrators unfurl a large Puerto Rican flag. 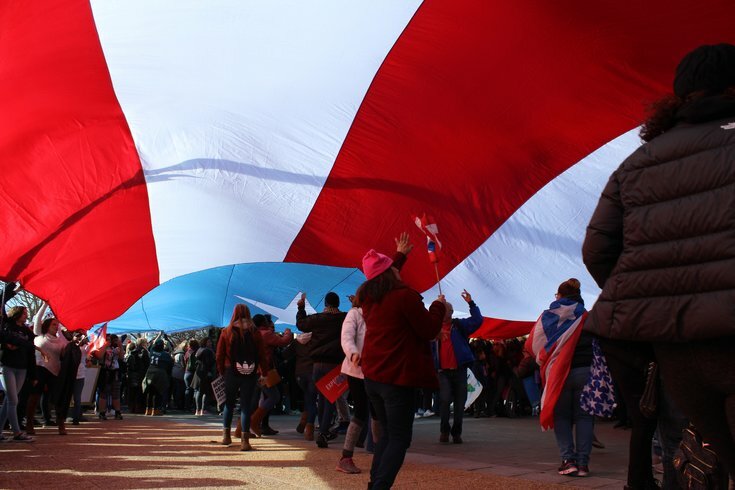 The third annual Women's March on Philadelphia will be held on Saturday, Jan. 19, and in preparation for the event, we have the details you'll need whether or not you're planning to go. This year's theme is "We Shall Be Heard" and the major walking/rally points are: gun violence, racism, antisemitism and Islamophobia. The march is also walking in support of the #TimesUp movement and for women's reproductive rights. On Facebook, nearly 3,000 people have already expressed interest in the event and at least 1,000 are expected to show up. In 2018, thousands showed up in Philly as part of the national movement that was taking the country — and world — by storm. The movement began in 2017 to protest for women's rights and against President Donald Trump. 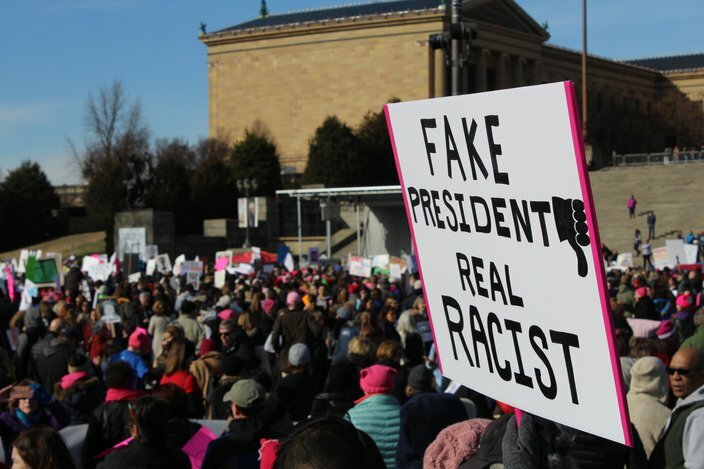 Two rallies in support of the march will take place at opposite ends of the Ben Franklin Parkway: One will start at 10 a.m. at LOVE Park, and the other will occur at Eakins Oval, near the Philadelphia Museum of Art following the march. Both locations will feature local speakers. The official march will assemble and begin on 1700 block of the Parkway and will end around 2 p.m. at the art museum, according to the organization's website. SEPTA Bus Routes 2, 7, 27, 32, 38, 43 and 48 will be detoured from their normal routes on Saturday to avoid the Ben Franklin Parkway area beginning at 5 a.m.that morning. The detours will remain in effect until approximately 5 p.m.
Detours will be posted and specific route changes are available on SEPTA's system status page. 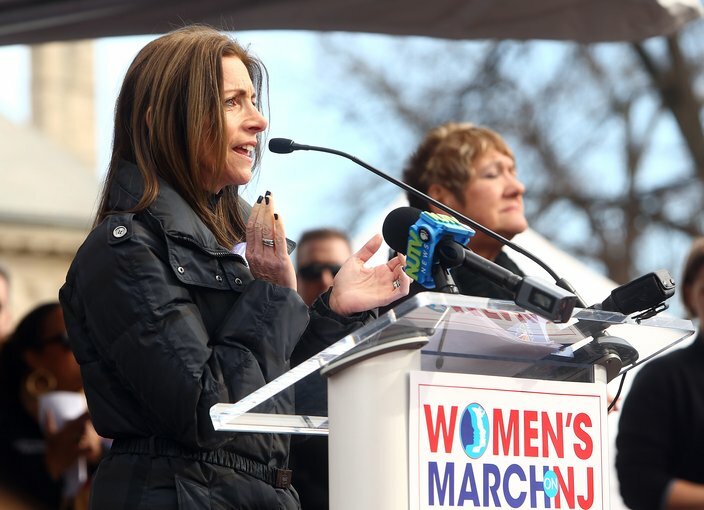 New Jersey first lady Tammy Murphy takes the stage to speak on the Morristown Green as thousands march through Morristown for the Women's March on New Jersey, one of the hundreds of events conducted around the nation to mark the one-year anniversary of the 2017 Women's March on Washington, the largest single-day protest in American history. Keep an eye on Saturday's forecast. The National Weather Service is predicting rain and snow all day Saturday with a high near 40 degrees, and an additional chance of sleet into the evening hours. If you cannot view the weather widget below, the latest weather predictions for Center City are available on the NWS forecast page. Also, check back here for weather updates later in the week. Beginning at 5 a.m. Saturday, inbound (eastbound) traffic on Kelly Drive must exit Kelly Drive at Fairmount Avenue due to the closure of the outer lanes on the Parkway. Those wishing to access the west side of the Philadelphia Museum of Art may continue to 25th Street and turn right on Anne d’Harnoncourt Drive, which wraps around behind the art museum. Those wishing to access the Barnes Foundation should follow Fairmount Avenue and then turn right on Pennsylvania Avenue, taking it to 21st Street. Turn right at 21st Street and make the first left onto Callowhill Street to enter the Barnes Foundation parking lot. Streets will be serviced and reopened as attendees disperse. It is expected that several of the impacted streets listed above will reopened to vehicular traffic prior to 5 p.m. The following streets will be posted as “Temporary No Parking” zones from 5 a.m. to 5 p.m. Saturday during the Women's March. Vehicles parked in "Temporary No Parking" locations during posted hours will be relocated. Thousands participated in the Philadelphia Women's March on Saturday, Jan. 20, 2018. It took place on the Ben Franklin Parkway near Eakins Oval and the Philadelphia Museum of art. Many of the participants carried signs with messages directed at President Donald Trump. The Philadelphia Museum of Art and other Parkway institutions like The Franklin Institute will remain open for business on Saturday.